I've mentioned in previous blogs that I'm no artist on pen and paper, and that I'm almost always hesitant to send a client a sketch of our cakes. I'll have beautiful visions and images in my head, but when I try to put pen to paper, it never comes out the way I intend. The recent Lego Superheroes cake... thankfully it turned out how we had pictured it in our heads and not what was on paper!! 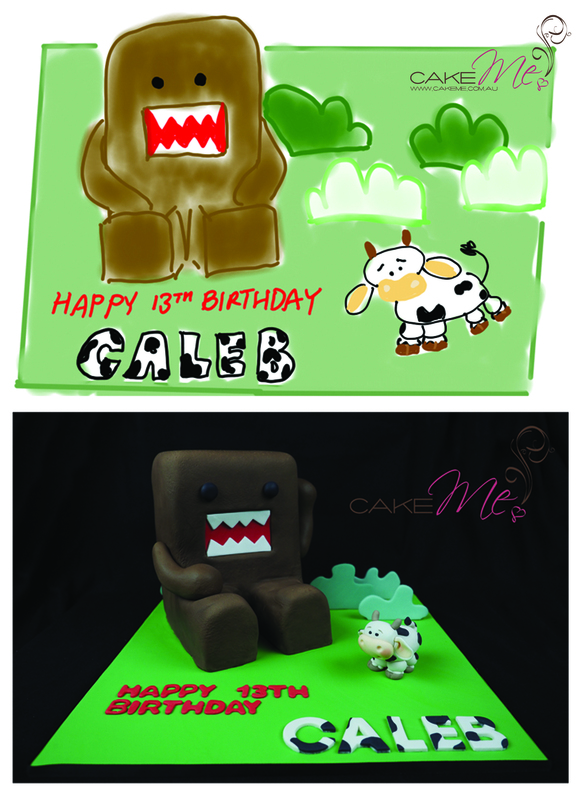 We also enjoy having the freedom to make changes to the design of the cake whilst we are making it as we are often able to create an effect that we didn't think was possible, whilst designing it (for example Domo with one arm up and the other down, or the weight of the sun topper floating above the cake instead of sitting on it) or improving the overall look of the cake (displaying the Hello Kitty cake on a rectangular cake board instead of a round board as quoted). I take pride in having real attention to detail, and at the same time, our cakes have clean lines, look fresh and have an uncluttered finish. But somehow my pictures always look like a scribbled mess and even I can't decipher what I've tried to transcribe from my head. Even my eleven year old niece critiques my sketches and tells me that she'll have to teach me how to draw one day. With cakes like Genevieve's Winter Wonderland themed cake, she was happy for us to design the cake whichever way we wanted, as long as it was not a "Frozen" cake. So originally we had planned a more "busy" cake that was round and unsculpted. Having the flexibility in design meant that we were able to sculpt the cake into an actual iceberg, and then decide to keep the lines clean and uncluttered, and not over-complicate the cake with the igloo or polar bear up top. Quite often, clients get so excited about their cake, they ask to see a sketch of what to expect. I'm always happy to provide a sketch, but always pre-warn them so that they won't doubt our cake-making abilities. So here I am exposing my vulnerabilities to you all... please don't judge me!!! If you would like to follow our blog, please subscribe here.